We, FEBU are a medium-sized enterprise with 23 employees. We are located in the industrial area of Burbach-Würgendorf with direct connection to the motorway A45. The company FEBU was founded in 1965. At that time the father of the present proprietor Mr. Andreas Fey started to produce punching, pressing and drawing tools as well as windscreen squeegees made of metal in the the parents’ house. For a first satisfaction of the steady growing space requirements due to the increasing demand, a production and storage hall of 150 m² was built in Burbach-Holzhausen in 1970. 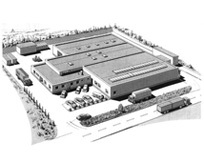 Because of the continuing and constant growth of the company and not at least because of good traffic connections, the production area and storage facilities were relocated to Burbach-Würgendorf in 1988. Today we have a production and storage hall of 3.850 m² size as a result of some expansions. We extended our range of products in all sectors during the recent years. Our longstanding experience in the production of punchings in many various ways as well as our own toolmaking enables us to respond rapidly and flexibly to your desires and to realise your requirements by return. Particularly in the pressing technique we could increase our sales due to investments in up-to-date machinery. Consequently we can provide the latest punching machines and eccentric presses up to a pressure of 200t. For the subsequent treatment welding presses, threading machines as well as stud welding machines and various other special machines are available in our premises. We can produce with custom-built tools manufactured by us or with tools provided by you. Among steel (blank, galvanized + coated) and stainless steel we also process non-ferrous metals. During the last few years we added the production of injection molding tools. Thus, the 2K tools for our new ice scrapers have been made in our company. We are also able to manufacture plastic injection molding parts (including 2K-parts) in wage labor. The production of cleanising devices includes the manufacturing of windscreen squeegees and floor squeegees made of metal as well as the manufacturing of different windscreen squeegees and ice scrapers made of plastic. The company FEBU was able to establish itself in the European market over the last 40 years. Even the export beyond European frontiers shows positive figures. Due to a convenient number of employees our company stays flexible and able to react rapidly to the special customer requirements. In the beginning of 2018 we changed our company legal status. Now we are FEBU GmbH.